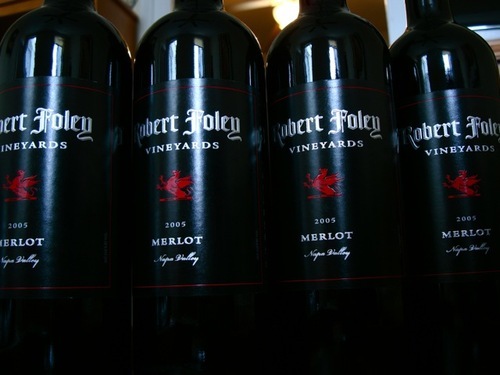 Two days ago, I uncorked a Robert Foley Vineyards 2005 Merlot from Napa Valley. To my shock and horror, the wine was not the smooth, silky, chocolaty nectar that I was anticipating—and I have come to revere this wine as a wine among wines—instead, in its place, swirling around my glass was a cantankerous, nefarious liquid, dusty and insipid with moldy carpet-like aromatics and an astringent character that might have served to disinfect all of Spanish Harlem. First, anger set in—surely I was sold bad bottles! Then, panic took over—perhaps it was my glassware, and I had ruined the $50-merlot now clustered around my kitchen sink (I had poured several bottles out into various glasses, decanted, double-decanted, dashed much of it down the drain in anger, etc, etc, etc) and was at that point confused: was the wine in fact corked or was it fine? Had my sense memory failed me? There was only one way to find out. I had purchased six bottles from Cabrini Liquors, a retail shop situated on the corner of 181st street and Cabrini Boulevard in far-up Manhattan. The wines were shipped to me in February. The first two bottles proved to be as delectable as any sentence in The Great Gatsby. So what happened to the other bottles? The wines lay on their side in the coolest part of my apartment—due to the lack of “wine cellar” or “wine fridge” (and I’m working on changing that). The apartment is carpeted, and I began to wonder if somehow it was all the carpet’s fault. Thinking on that I nearly tore the carpet to shreds and was prepared to curse out my landlord for not installing a temperature-controlled room in our three-room apartment. Alas!! I refrained from both tactics. After returning the wine to bottle from decanter, I stopped the bottles with rubber stoppers and sucked out any remaining air. I called Cabrini and arranged to bring the wine back on Monday evening, two days out from the whole affair. The trip to Cabrini was a good hour-long subway ride, and in New York City the subway presents a good opportunity to catch up on reading. I brought along the last five New Yorkers. I read about the Madoff Ponzi scheme. I was angry and sympathetic twoard the people that he swindled. I wanted to do something about it. I wanted to accuse someone—of something, anything…for ruining my wine! I was prepared to accuse the good people at Cabrini of trying to put one over on me—I mean, they’re practically in the Bronx! To my surprise, the store was an unexpected playground of rare and fine wines all priced well-below market-value, or at least, New York City market value. I was greeted by Damian, Cabrini’s “wine-director.” He led me to the “office” where dozens and dozens of bottles lay recently opened for tasting (they were planning a big event and had to “familiarize” themselves with the wines). After a brief introduction I retrieved my four bottles of remaining Foley Merlot, two unopened, two vacuum packed. We poured them into four glasses and tasted. “These wines are not corked,” said Rami, through perfectly aligned purple-stained teeth. “Very, very tight for a California Merlot,” said Damian. And by Jove, the bastards were right. What had happened in the course of the wine’s two day sleep-over in my refrigerator? Had they corrected themselves? I was despondent. Damian explained that wine is complex, alive, and as a small production can vary greatly in terms of bottling from barrel to barrel and bottle to bottle. The wine needed to decant, he said. Well, I had decanted it, I told him, a bit defensive. “Where do you keep your glasses,” asked Damian. Wine is indeed a living, breathing creature and reacts to its environment. So, good people, sterilize those glasses and for heaven’s sake, even if they look nice, don’t hang them upside down on a rack in your kitchen. Same goes for ordering wine at a bar—if you see them storing their glasses as such—order beer. Tags: Robert Foley Merlot, Robert Foley Vineyards. huh, that’s really interesting. way to spin a good yarn too! I was actually laughing aloud.